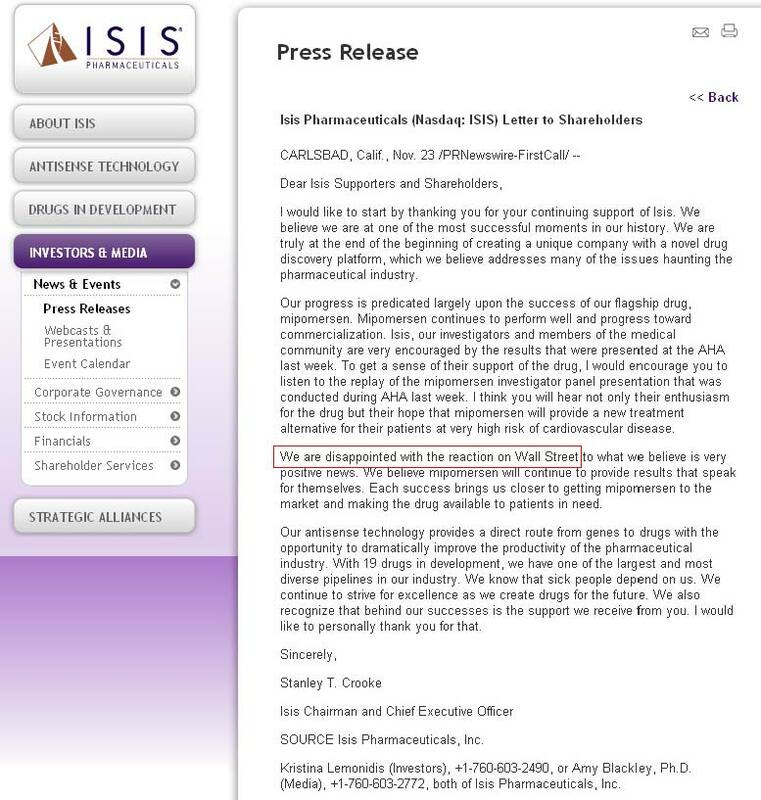 Isis Pharmaceuticals (ISIS) has been collaborating with Genzyme (GENZ) on their phase 3 study of mipomersen, a drug that (in layman's terms) helps people metabolize cholesterol, thus reducing risk of cardiovascular troubles. 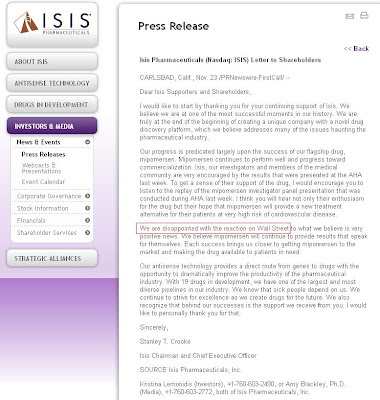 Last week, the two companies announced results from a phase 3 study of the drug, and ISIS shares promptly dropped 15%. Part of the disappointment came from partner Genzyme's delay in filing for the drug, certainly a valid reason for investors to be spooked. Multiple sell-side Wall Street firms defended ISIS shares, even suggesting people scoop them up on the selloff. They think the next phase of study will show even better progress, and shares will rebound. This could very well be the case, but someone has been telling the CEO to "get the story out there." Unhappy with the investment community's reaction to the data, the CEO released a STUPID letter, in essence telling people they didn't react properly. If that's the case, the company ought to simply go about its business and the results will speak for themselves. "Trigger-happy" companies, in terms of unnecessary press releases and letters like this, throw up a red sign.